The 12 Central Suns and their Pyramid connection to Planet Earth. There is an acceleration now of the ascension of this Universe, and especially the Milky Way Galaxy to which we belong, into a much higher evolutionary state. As life then within such a Galaxy and even the greater cosmic whole is intricately involved and linked to the other, one part of a galaxy or solar system cannot ascend and evolve, without the rest of its body or form. As planet earth then is being reinvented, so are we, for our physical bodies are very much linked to Mother Earth and in as much as we live and breathe on her, we are part and particle of all life form and life organisms on her. As she is a living and breathing cell with billions of other cells all communicating with each other – so are we. In Ancient days when the outer planet was first created, it was then felt that this planet would have to be not only connected to the Milky Way Galaxy, but, as all other planets and solar systems within her core, connected to the 7th Central Sun and the 12th Central Sun as well. There was a much higher reason for this, for in those times, this galaxy was very near both these Suns, and a lot of light or creation came forth from these two central suns, and the 9th. So, we have three Sun then forming a triad – the 7th, 9th, and 12th and this was considered a sacred triad, and therefore you will find that the number 3 will repeat itself in ancient architecture as well as in symbols, and it is amplified by the energy or the symbol of the Sun – in whatever hidden way that may be recorded. When the first structuring therefore of certain energy systems were put into place, as in the Crystal Pyramids, the first 12 Master Pyramids, and the whole energy systems, they were therefore programmed to co-ordinate with the sacred triad formed by these central Suns. Mankind in some way has remembered this, but has forgotten all about these central Suns. So what are they? When the first 12 Master Galaxies were first created from which all life on this planet comes from, these were the first ever to be created. Unfortunately during the wars of heavens three of these were destroyed, and thus what used to be Lyra, Andromeda (in its original creation, and Cygnus Major (forgotten in the mists of time)), had to vacated. But the 12 Central Suns then formed the nucleus of this whole system, and all other suns, lesser ones and bigger ones then were created in their image. What makes the 12 Central Suns so interesting is that they hold the pyramid power within them and at their very core. They therefore act as immense transmitters pulsating with the encoded Light Frequency Pulsating Rays that work with our own sun. However, within this planet, certain hidden mechanisms were put in place, so that no matter if catastrophes struck and the earth would be thrown out of orbit, that it would be linked centrally to these three Master Suns. In the beginning then all these immense energy generators were all fed by these mechanisms of the Central Sun and therefore the energy generated was considered sacred and an immense gift from the 12 Master Galaxies at the time. It was also considered that the creative force necessary to then expand this energy and use it in creative energy forms which would come via the Female Aspect of the Moon energy – as expressed via the Goddess herself, but she held within her the encodements of the 9th Central Sun – thus then within that sacred triad. So the Moon energy was not so much then energy of the Moon as we know it (for it indeed was created as a satellite station of the Intergalactic Fleet), but of what was implanted into the earth herself, and therefore held that energy of the 9th Central Sun, and then would merge this power with that of the Cosmic 7th and 12th Central Suns. This Moon Energy was thus incorporated in a major center on planet earth and totally forgotten about. The self-destructive tendencies of mankind, made that a lot of the original energy systems were shut down at some stage – mainly because of the earth being thrown out of orbit as the whole lower part of this solar system, by the Planet that blew itself up, and massive asteroid (pieces of the planet), and comets hitting the earth. The Intergalactic Fleet later restored her into orbit, but in the process some of the planets changes places around the sun in our solar system. In that then also the repercussions were felt in that the whole first creation of earth in its original creation had then been reshuffled, with some land masses now buried under huge space debris and mass upheavals caused by the comets and asteroids hitting her, and also by land masses sinking under the sea, and some rising up. Most importantly during this time she shifted on her axis three times. In the process mankind remembered about the Sun and the Moon energies, but because of having completely lost the original understanding of this, assumed that the moon meant the local moon, and not the original understanding of this. At this time, a funnel has opened up, within the Milky Way Galaxy, as she is moving closer to the Andromendan galaxy now, and is again linking up with these 12 Central Suns and has now for some time. This means that the energy centers within the earth which work with the energies of this triad, are now starting to get reactivated again. This has now lifted the planet into the 5D and is going to accelerate this whole process of evolutionary change on the planet 777 thousand times, and then step up to 999 and then ultimately into 12-12-12. 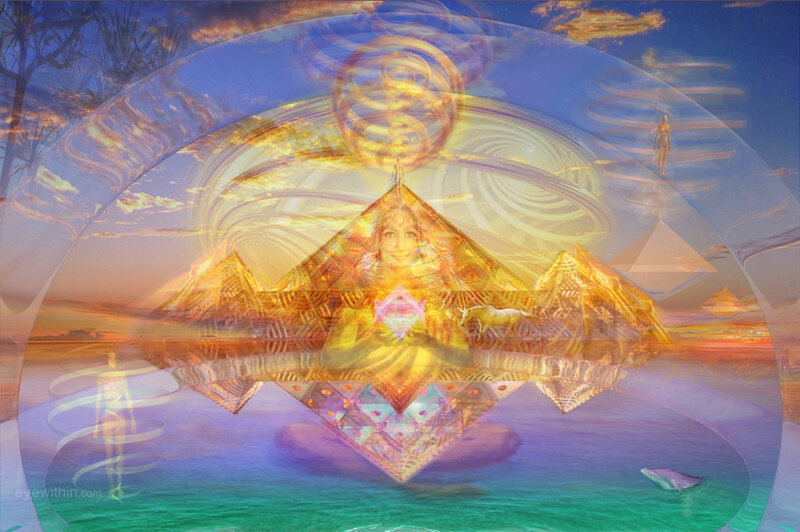 This is a mass recharging that is taking place, and therefore the dormant pyramid energies are being reactivated. The Giza pyramids and those known to man are more primitive replicas of the first pyramids, now rising. Giza never was the main center – it was merely a type of reminder to mankind of what had been before. Although it did serve as a massive energy generator in the second civilization on earth, that destroyed itself, and then as Atlantis was falling, those scientists from Atlantis starting the new colony in Egypt on the remains of the what was left of the second civilization, then revamped it, but never could succeed in restoring it to its prior glory and full activation. So, we are therefore now being catapulted into the 5th dimension and in for immense changes on all fronts. This is not child’s play – this is serious. Indeed the import of this will only be felt in ten years time when this planet will have changed beyond recognition.